Music as a therapeutic element in Transpersonal therapy. Many mythologies agree to place the sound as creator and first expression matrix of the universe, from the “OM” of Hindu culture to “Fiat Lux” of the Bible. Language is organized sound, and music is a language that speaks to the deepest dimension of the human being. Music began as sacred language and the human being as an element has used magical rituals and celebrations since the beginning of time. Music and dance together tribes, songs and percussive instruments are elements still used today to unite and heal. In the shamanic tradition, the shaman guides and communicates with the spirit world by chanting, the rattle and drum. This showed the power of changing consciousness through high and low frequencies produced by these instruments, which interfere with the normal functioning of the brain, giving further access to inner realities (1). Sound is a vibration that creates a wave that reverberates not only in the ear, but throughout our being, as we are, as material beings, vibrating energy. This vibration penetrates us and makes us move with it physically and mentally. Different traditions and cultures have generated all kinds of musical expressions, and express all human activities, from the most sacred to the most profane. We have developed techniques, instruments, rhythms and melodies that have allowed us to convey an infinite variety of experiences and feelings. In transpersonal therapy, the therapist works with the change of consciousness (2). The communication and aid the therapist can give in this framework are very different from what one would expect in other therapeutic frameworks. The capacity for empathy, instinct and spontaneous action from an inner logic of the moment, takes centre stage. Personal experience in those states as well as the point of spiritual evolution of the therapist, are what make the professional responsiveness of each situation. In the case of the use of music as a therapeutic element, the subjective experience of the therapist should be able to “connect”, empathize with the needs of the person or persons with whom they interact, to stimulate sensitivity without interfering negatively in the process. The therapeutic use of resources is determined by the intent or the method chosen by the therapist at each session. It’s also determined by the origin of the biographical person who will accompany or guide, each session must be carefully prepared to adapt to every situation and always having enough material resources. The same music may not work well in two similar situations, in people of different cultural or social origin, or of different generations but of similar origin. I propose a test of musical sensitivity to help determine which music can induce certain associated experiences. In this test try to find out the likes and dislikes to different types of musical compositions, and their psychological and physical reaction to various archetypal music auditions. There are many forms of music, and the task of describing all musicological represents an enormous effort that is beyond the competence of the therapist. At the same time there are all sorts of classifications to fit them into the cultural context. Anyone wishing to use music in therapy must, if they want to do a competent job, have the widest possible knowledge of the various fields, genres and registers in which the various world music is located. All intellectual resources in this regard can be helpful in this task, since all human knowledge baggage deeper into the mystery of the individual. I encourage all who work with music as a therapy to investigate and go beyond their cultural and intellectual boundaries, using the experience of their strengths as a guide for self learning. As a method of understanding different musical expressions, i studied heading resonance and vibracional dynamics of the human body, understanding those to be both physical and pure energy. Wilhem Reich (2), one time eminent disciple of Freud, developed the theory of muscle armor and psychic contents, which gave perennial wisdom a western scientific language. The human being is a composite of interdependent parts ranging from his animal condition to his higher self. These seven parts connect the energy of material life with the higher energy of the cosmos. 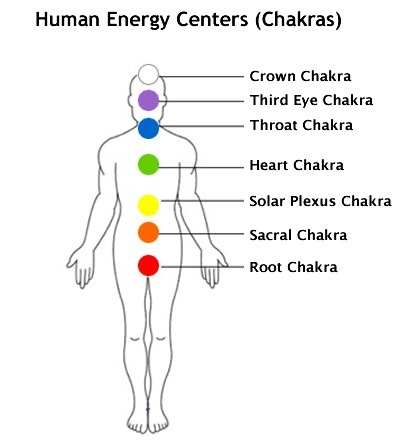 Hindu culture called “chakras” or “wheels” each of the energy distribution points located along the energy counterpart of the spine. Each of these centers is associated with a whole part of our physical body, blood circulation; nerves housed there, the muscles and glands. And also connects with aspects of the psyche that relate to that section of the body. The psychic powers of each of the centers vibrate with all aspects of reality, which of course include music as a vibrational element. From our organic aspects, the instinctive mind, to spiritual and transpersonal experiences. This would be a graphic outline of the energy centers with their correspondences (3). Following the pattern of the seven energy centers of the body, you can place each musical expression in relation to them. Energy connection to the earth, root chakra, bass, musical note C, primitive instruments, tribal dances, music with drums, ethnic music tribal origin. Clearinghouse of vital energy (orgone, “shakti”, “Chi”), chakra of sensuality and sexuality, musical note Re, festive dances, drum rhythms to move the hips, all types of popular music for dancing in couples, rock & roll, Brazilian music, Arabic music belly dance, rumba, etc.. Emotional Center: Musical note Mi, undulating rhythms ¾ or 6/4, importance of melody, minor scales, emotional issues and emotional, melodic music, songs of love and hate, waltzes. Center feelings, musical note F, anthemic music, church music, older tunes to be sung in groups or with that possibility, musical expressions of Universal Love. Communication Center and the logical mind, home control, musical note Sol, solo voices, chorus, mantras, throat singing, music associated with the control or lack of control, military music, jazz conceptual, contemporary classical music, experimental music, humorous or circus music. Center and creatively superior mind, the third eye of Eastern cultures, musical note’s, scenic music, soundtracks, music for meditation, faith-based classical music, classical Indian music. Connection to higher energies, musical note If, ​​treble, ultra sounds, music shamanic instruments using harmonics, sacred music. There are different types of transpersonal therapies where music is used as a resource. All therapists and therapy have developed structures of guidance and musical accompaniment. Classical music, for its infinite expressions of human feeling, with its changing dynamics and for its wide variety of styles is most often used today in music therapy. Also ethnic tribal music as a source is used in Holotropic breathing and its variants. “New age” music is often used and Indian classical music or mantras in relaxations and meditations. In body movement therapies such as “Energy centers therapy” or “Biodance”, are using all kinds of music records with preference for pop or “popular” dance of all countries. Although these therapies are not properly transpersonal, many transpersonal therapists use them in certain circumstances and can get access, though that’s not its purpose to cathartic states or peak experiences. Clearly, even within transpersonal the therapy is a primary goal, the spiritual quest is also a very important element is interdisciplinary scientific research. This framework allows constant updating of techniques and research. In the relatively short existence of the Transpersonal environment, numerous experiments have been conducted and many techniques have been developed, as befits a discipline that aims to cover a vast field of study and experience. Some of these techniques and experiments have used music as an element, sometimes getting surprising results, such as the experiment on the reduction of pain in post-operative processes, performed by Overton, Martha Elizabeth Smith, MTP at the Institute of Transpersonal psychology in 1994 (5). It is remarkable the use of music that Dr. Salvador Roquet made in therapy during the 60’s. He developed a type of therapy he termed psychosinthesis where entheogenic therapy combined with music and projections. He used all kinds of music and recordings that he mixed at the time to facilitate the transition of “travellers” in the sessions. It is very interesting to see how pre-recorded sounds and voices are use to accentuate the effects of music (eg children crying, previous sessions or a Hitler speech). It was certainly a pioneer in a field as popular today as the use of samples and mixtures. In the era of pioneering discoveries about entheogenic substances in the years 50-60 and their legal status until its ban in the 70 created great expectations within the possibilities offered by these substances. In 1965 Dr. James Fadiman conducted a series of experiments on the influence of LSD on creativity which brought together a number of technical issues facing professionals under the effects of entheogens. The music that was used in those sessions to promote creativity was jazz. Currently with the new climate created regarding entheogenic therapies new research possibilities are opening for experimentation. Therapists such as Fernando Latorre use songs and instruments of shamanic origin in therapy sessions with Ayahuasca. These songs improvised or “inspired”, they so called “Icaros” which serve both to guide and to sanctify the substance. In the United States musicians like Mickey Hart of the Grateful Dead or the therapist and musician Byron Metcalf worked with percussion music in shamanic therapies. Dr. J. C. Bouso, who pioneered research with MDMA in Spain, argued in one of his lectures (Barcelona, ​​2010) on the healing capacity of the combination of electronic music elements + + MDMA tribal dance that occurs in outdoor parties called ” Raves “. He even came to purpose a type of therapy with these elements. As I explained, the introduction of music in a therapeutic context in general can provide access to psychic materials, but Transpersonal therapies working with altered states of consciousness (EMC’s) or by substances or practices ecstatic, the music takes on a importance. The EMC’s are distinguished, among other features, a higher sensitivity and a loss of the barrier between the inner world and the outer world. It’s understood that introducing the sound element in whatever manner greatly influences the dynamic content even in the experience. Even if therapy is in origin shamanic it may become the axis of experience. The sensitivity to the sound elements to use come from the therapist’s self-experimentation with these elements. It is necessary to choose music or instruments that we use before the session very carefully, taking into account the needs of the audience. The types of sound elements modulate the depth and dynamics of the session. The introduction of sound element, in the form of instrument or music or sounds, can be decisive in a therapy session. The choice of these elements must be determined very carefully, and always starting from a previous therapist auto experimentation of that element and an analysis of the personal situation of those attending therapy. Any element can be used but always in relation to the therapeutic need. I think the current climate will favour opening novel avenues of experimentation in this regard. JORDI ÀLVAREZ CARNIAGO: Transpersonal psychotherapist. He’s member of the European Transpersonal Association EUROTAS. Mircea Eliade in his book Shamanism: Archaic Techniques of Ecstasy (Fondo de Cultura Economica. Mexico 1976), makes a profound study on sound techniques of shamans from around the world and its importance for achieving EMC’s. It is also very interesting to know the work of Michael Harner. Harner has been considered a leading authority in the study of shamanism, and currently teaches several seminars based shamanic techniques described in the book The Way of the Shaman (Planeta. Barcelona 1994) thus being dubbed “the shaman white “. (1998). The self-realized man: Toward a Psychology of Being. Editorial Kairos. Barcelona 1973. Dr. Hugo Ardiles, musician and therapist, developed together with dancer Susana gymnastics Milderman energy centers, therapeutic system based on the chakras and the theory of Wilhelm Reich muscular armor. From my personal experiences participating in therapy that I have extracted the following musical management system the energy centers of the human body. Effect of music on pain and physiological response in the post anesthesia care unit by Overton, Martha Elizabeth Smith, MTP, Institute of Transpersonal Psychology, Palo Alto, Calif. USA, 1994.